Vault 7, Philosemitism – and more – ITEL Radio – 3.11.17 | Inside the Eye - Live! Inside the Eye – Live! for Saturday, March 11, 2017, discussed the rather skeptical idea that employees working inside the government need to tapping in to everyone’s televisions, cell phones, and related listening enabled devices for the stated purpose of “protecting everyone”. We then discussed the Wikileaks “Vault 7” release, wherein the CIA is alleged to have lost its control over its own hacking espionage arsenal. The latter half of the show involved a musing on “philo-Semitism”, and the dangers posed to humanity by not speaking out and against Jewish aggression towards the West and humanity at large. One of the lamest ideas put forward by intelligence forces vis-a-vis their media in the West is this rather absurd idea that those employees of the government (we the people) need these employees to be monitoring and sticking their noses into the private affairs of the citizenry. Under the guise of “protecting us”, we tolerate in many cases a group of sleazy, perverted psychopaths into our homes for no other reason other than their entertainment at everyone else’s expense. After all, with over 192 million documented photographs of sexually exploited children discovered on the Internet, the proliferation of just this small slice of organized criminality is clearly a massive operation with a customer base to match. Yet, with all this open ended capability of intelligence employees to tap and discern hidden criminal behavior, very little seems to be being done in the way of massive targeting and smashing of these organized criminal exploitation efforts. 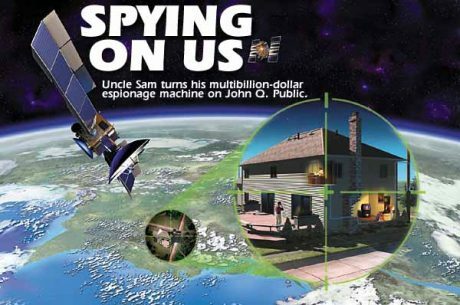 As discussed in the show: perhaps the real reason for all that wiretapping and spying capability is not to bring down the criminal empires spread across the Earth, but rather to protect the criminal empires that operate within the deepest darkest netherworld of the “National Security” state. 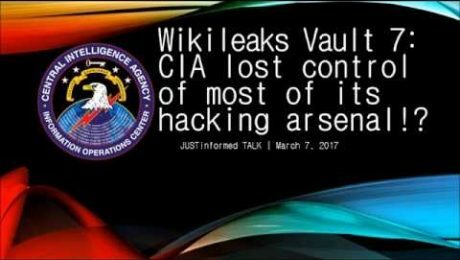 Vault 7 – Loss of Hacking Arsenal – A Criminal Conspiracy? As someone who has been a victim of unbridled, intrusive (24/7) surveillance by government employed criminals, few need to educate me as to the dangers of allowing perverts and criminals into your home through the use of electronic monitoring and worse. The idea that there needed to be a hack on Samsung televisions so as to enable intrusive spying on people’s homes is absurd. Other devices like Amazon’s “Alexa” or Google’s assistant, each appear to also be linked to the CIA. For what? Really? And then we hear that the CIA “lost control of its hacking arsenal”? To whom? Who would have the capability to know of these arsenals and then acquire them, essentially “free of charge”? So we now learn that the CIA has created an army of cyber-warfare and intelligence capabilities, and now those capabilities have essentially been given away. And people trust these idiots to mind and monitor themselves without themselves being monitored and watched equally by we the people? To end the show, we went on a rather long musing on the dangers of “philo-Semitism”. Philosemitism is the irrational acquiescence of the self to trust and “love Jews” to the point of blind trust of an enemy within which seeks the destruction of Western civilization. For instance, Jews like to link “the Holocaustâ„¢” to the plight of African descendants in America. Â Jews like to profess that both Jews and blacks were “oppressed by the White man” and so, blacks and Jews have a shared history of oppression at the hands of Whites. Yet history tells us that it was Jews who were the primary instigators and progenitors of the African slave trade and that while living under White “tutelage” in America, African descendants in America have multiplied their population to over 40 million souls. Â Never mind that a statistically relevant number of blacks have been and continue to wage rampant random acts of war against America’s White population exponentiallyÂ beyond the documented 2000 or so lynchings of blacks since the American Civil War. Remind us again: with blacks numbers increasing to over 40 million souls in America, where, exactly, is this so called “holocaust of blacks” that Jews want to insinuate through linking the plight of blacks to their self declared Holocaustâ„¢? Oh, and we know that black communities were targeted by the CIA in the 1990’s and perhaps before, but the CIA is an equal opportunity operation when it comes to victimizing unknowing and innocent population bases. Â Of course, realizing all of that takes you back to the reasons why the CIA probably feels a need to conduct massive spying in the first place. Â Covering up massive criminal conspiracies requires massive surveillance to ensure that any attempts to get any inquiry out must be nipped in the bud before inquiry gets too far out of hand. After all, can you blame Jews for their paranoia when they know they killed over 100 million Whites last century through their criminal and fraudulent narratives while directly engineering the mass murder of perhaps 15 million Germans after WWII and 40 million Russians and Ukrainians before, during, and after World War II?